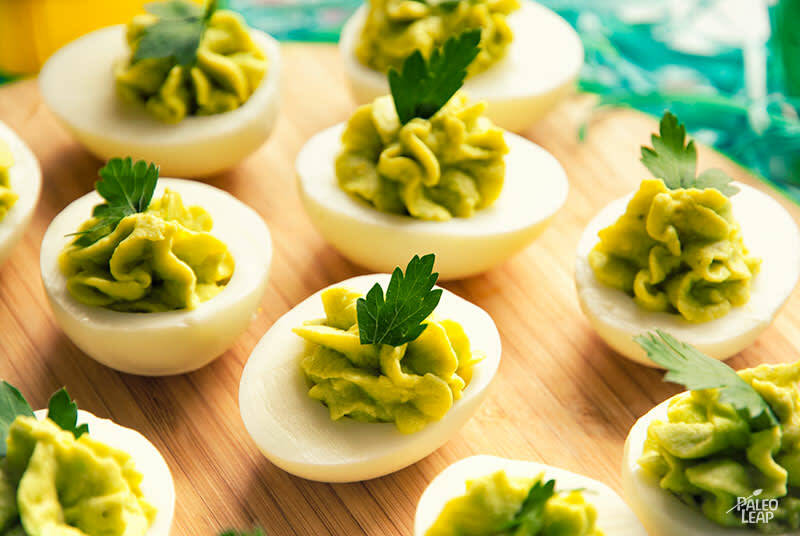 Here’s a fresh new twist on the “deviled egg” theme: keep the irresistibly creamy center, but go easy on the mayo and add an avocado instead. The bright, spring-green color is perfect for the early days of warmer weather, and the taste is lighter without being bland. If you always found traditional deviled eggs to be a little heavy, this is definitely a recipe to try. Sprinkle them with paprika to add a dash of spice, or just leave them as they are, smooth and creamy with just a hint of tang from the lime juice. To make sure you get the perfect guacamole, make sure to cook the eggs just long enough: overcooking will make them chalky and crumbly. Start them in cool water (don’t boil the water and then drop in the eggs), and keep an eye on the pot so you can switch the eggs to cold water on time. Of course, as well as being a culinary treat, the combination of egg yolk and avocado is also about as nutritious as you can get. Just one serving of these eggs is packed with every vitamin on the list, especially A, B5, B12, E, K, and selenium. The whites don’t contribute much in terms of micronutrients, but they do deliver some quality protein (not to mention a handy cup for the guac). 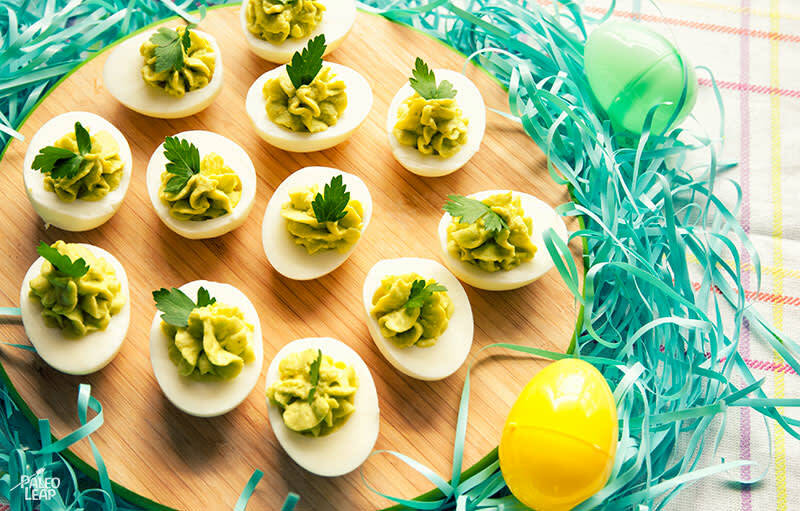 If you’re on the hunt for a nutrient-packed springtime treat, you can’t go wrong with such a cheerful and eye-catching finger food. SERVES: 4 PREP: 15 min. COOK: 10 min. Place all the eggs in a saucepan filled with cold water and bring to a boil. Turn off the heat as soon as the water boils and let the eggs gently cook, covered, for 10 to 12 minutes. Immerse the eggs in cold water to stop the cooking. Peel the eggs when they are cool enough to handle. Cut the peeled eggs in half lengthwise. Remove the egg yolks and place 4 of them in a bowl, discarding the remaining two (or simply eat them as an extra snack). Add the ripe avocado, lime juice, onion powder, garlic powder, mayonnaise (if using), and season with salt and pepper to taste. Fill each egg white with the avocado and egg yolk mixture, and top with some flat leaf parsley (you can also sprinkle on some paprika, if you like). You can use a piping bag if you have one handy to make the stylish twirl with the mixture.